We are proud to introduce our newest product, the 5/8 Cascade Steel Straight Razor! It is handmade in our Portland, OR facility (just like the rest of our straight razors) and it features a vintage profile. It is also our first production razor to ever be made of stainless steel! The 5/8 Cascade Steel Straight Razor is available in both square and round points and launched last week with 4 scales options. With the Cascade Steel Straight Razors, we set our sights on making our best production straight razor yet: a razor with classic style and the quality of old American craftsmanship, with the best modern materials available to us. Since our founding we have worked to make modern straight razors worthy of handing down to future generations. To us this means making an heirloom quality product that honors the tradition of the straight razor and utilizes modern advancements in materials and technology to make something that is truly at the forefront. For this straight razor we wanted to make something that would step up our game and be our most useable grooming tool yet. The 5/8 Cascade Steel Straight Razor fits in the hand, has excellent balance between the blade and the scales, and is our first stain-resistant razor model. Stainless steel razors are somewhat disreputable in the straight razor community. Many stainless razors seem brittle, difficult to maintain, and just don’t shave quite as smoothly as their high-carbon steel counterparts. On one hand, high carbon steel straight razors work very well. On the other hand, high carbon steel is hard to take care of and is unlike other blades most of us have in our lives - pocket knives, kitchen knives, scissors, garden shears - the majority of these cutting tools are stain-resistant and in 2017 we expect that our metals don’t rust. It would be a shame not to try and make a stainless razor ourselves that we found to be comparable if not higher-performing than high-carbon steel razors. Stainless straight razors get a bad rap and we attribute these negative characteristics to unwanted chromium carbide formation, a common tradeoff in stainless blade steels. So, if we could find the right stainless steel and heat treat it optimally to minimize chromium carbide formation, we suspected we could make a superior razor steel. It took some time, but we believe our persistence paid off! Fueled by our obsession with performance and finding the right tool for the job, we experimented with a number of new blade steels and heat treatment processes to find the ultimate razor steel. Not only did these experiments result in a new product, they lead to marked improvements to our heat treatment protocol across all of our straight razors. Our Classic Line and Artisan Line blades also leveled up as a result of our experimentation with heat treating the Cascade Steel blades. All of our blades now in production are harder, thinner, and sharper than earlier production models and we aren’t afraid to say that these are our best production razors yet. As for the look of the razor - you all are very vocal in your requests for a more vintage-looking razor from us -- we hope this razor shows that we take your comments to heart! With this in mind, we turned to our favorite vintage straight razors for inspiration. Familiar lines, a lick of our signature style, and cutting edge materials have made this a fast favorite around the shop; we are all very excited to finally have it in production! WHAT SETS THE CASCADE STEEL STRAIGHT RAZOR APART? Smaller Carbides = Improved Sharpness. We used a modern steel engineered specifically for use in delicate cutting instruments which, with optimal heat treatment, results in the finest cutting edge available. The edge is more aggressive and shaves with less effort and more audible feedback, improving the overall shaving experience by reducing resistance. Nobody likes having to strop mid-shave. Harder, more wear-resistant steels result in longer-lasting edges that glide through coarse beard growth with ease. Increased Chromium Content = Improved Stain-Resistance. A slightly higher percentage of chromium balanced with the right amount of carbon makes this steel more stain-resistant without creating unwanted chromium carbides. One usually has to compromise carbide size for stain-resistance, but not in this case; the Cascade Steel edge shaves at least as well as O1, if not better! 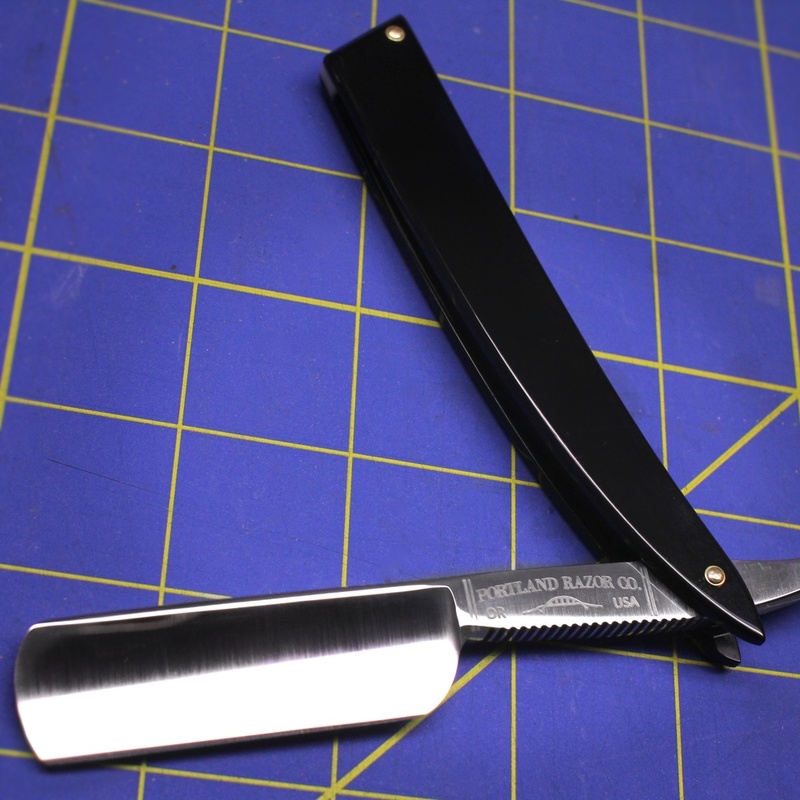 Portland Razor Co. is back up and running following a flooding incident on February 10th. We lost some time and materials, but our infrastructure is intact and we are working on pending orders again. We have made changes--detailed below--to our product line and all new orders will include these changes. If you ordered after Dec 15th, you have the option of updating your order to the new specifications. EMAIL US if you wish to do so; we will not update your order if we don't hear from you. New razors will be released soon here on the blog with photos while we update the rest of the website. We are updating our permanent collection of straight razors. Customer input guided what features we kept and what we changed, and we have come up with a new design that we feel maintains all the best-loved features of our blades while improving or eliminating problematic features. These changes apply to all of our existing blade shapes: Siren, Hydra, Leviathan, and Kraken. A look at two of our updated straight razors, side-by-side. Our new straight razor design features more subtle contours at the heel, a narrower shank, and improved jimping. No More Heel Notch. We have eliminated the double curvature of the old heel notch in favor of a more traditional angle. It was determined that the old notch, while giving some users a nice point to index their thumb with, was also uncomfortable for some shavers. The new design retains the attractive curvature of the original while resolving some functional issues. Thicker Bar Stock. The original 6/8 design used 3/16” bar stock, which is easy to find and work with. However, 3/16" is problematic for honing, as the thickness in relation to the width of the blade requires two pieces of tape to get the best angle for the final cutting bevel. By using slightly thicker bar stock (7/32”) we are now able to use only one piece of tape to set the bevel; a more widely accepted standard. As a blade is used and honed over time, we expect this to permit an earlier transition to no-tape honing. Some side-effects of the wider bar stock are a slight increase in weight, and significantly improved tactile surface area on the shank for better balance and control while shaving. UPDATE 10/23/2017: due to production changes, we now hone all of our production razors without tape. Narrower Shank. To compliment the wider barstock, we have tapered the shank so it narrows nearest the shoulder. This makes for better handling, especially while stropping. First and foremost, it makes a better razor! An increase in the number of designs we can offer. Shorter lead times for new orders. The End of the Gustave. Alas, our beloved Gustave shall be no more. We saved a lot of time on the Gustave by omitting minor steps that had to be done by hand, i.e. the jimps and top notch, and passed those time savings on to the consumer. However, now that we no longer have to file the jimps by hand we can offer a better razor at the same $120 price point. The Siren shall take the place of the Gustave as our entry-level razor. The improved "Siren" in Ivory Acrylic scales, nesting the all-new "Shorty" straight razor in Black Acrylic. Standard Scale Materials. Driven by a desire to reduce our environmental impact and keep 100% of our production in Portland and the U.S., we have decided to eliminate African Mahogany as a standard scales option. We are also transitioning to Maple and Walnut sourced exclusively in the Pacific Northwest. You can still inquire re: custom scales materials by emailing us directly. 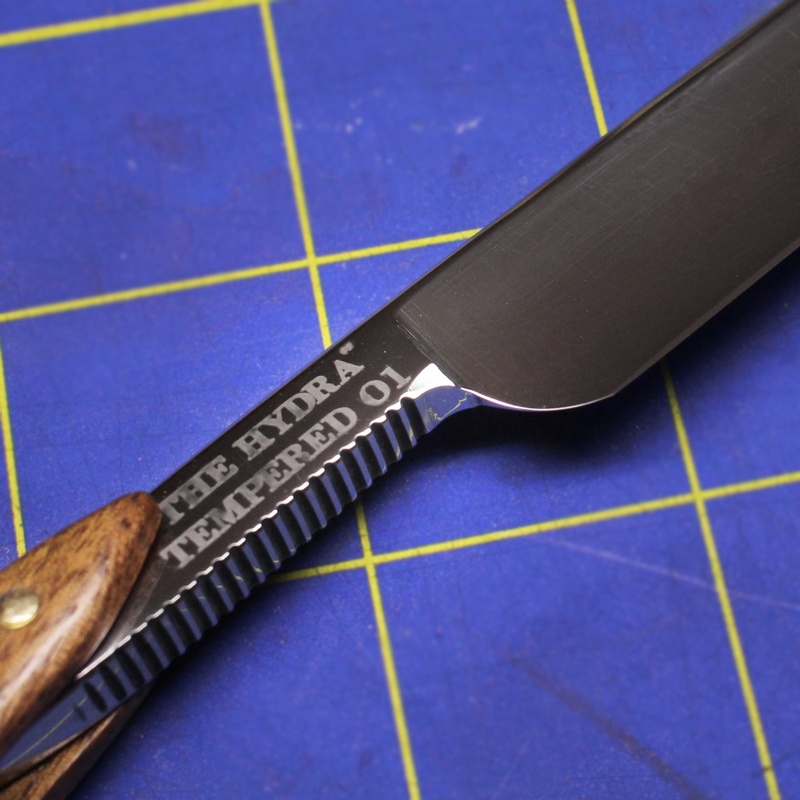 Detail of the "Shorty" straight razor. Introducing our "Shorty" Straight Razor. We haven't settled on an official name for this beauty yet, but for now we're calling it the "Shorty." Fueled by widespread interest in the straight shaving community, we are proud to introduce our "Shorty" straight razor. Our round-pointed "Shorty" has a 2-inch blade and a longer shank than our other razors, which maintains the feel of a traditional razor while being more nimble; it excels especially at side-passes under the jawline, and in concave areas of the face which are hard to reach with longer blades. The design was also influenced largely by discussions with female shavers wanting a blade that was easier to maneuver around the shin bone, ankle, knees, underarms and everywhere in between. The Addition of the Artisan Line. The Artisan line was developed in response to increased demand for larger blades, unique scale materials, and more interesting shapes. These include 7/8 and 8/8 blades cut from ¼” stock, unique scale materials like bone, horn, and beautifully dyed and stabilized woods. The Artisan razors are still being prototyped and will be launching in the near future. Our Kamisori. Included in the new Artisan line is a Kamisori-style razor. Kamisori are a traditional Japanese razor that has seen increased popularity abroad over the past few decades. These beautiful blades are only produced by old manufacturers in Japan and by a few custom makers here in the U.S. We are proud to introduce our own interpretation of the traditional Kamisori, featuring a modern Western hollow grind and handles wrapped in Waxed Irish Linen thread. This is also being prototyped for future release. New Strop Design. Our strop now features D-Rings at the trailing ends as well as the anchor point. This gives the end user universal mounting options and easier access to the interior surface of the strop. We also pre-condition our strops by hand with neatsfoot oil, and glass-burnish the edges and stropping surface for added smoothness and structure. All pending orders will include these updates. Other Products. We now have an industrial sewing machine and are prototyping new products to accompany our razors and strops! Our merino wool sheaths have been a pretty big hit with some customers, so we are finalizing a new design and will be offering those for individual purchase soon. Honing Services. We have informally offered honing services for a long time. Formally, we will now hone any razor in good condition for $20 per blade, plus shipping. 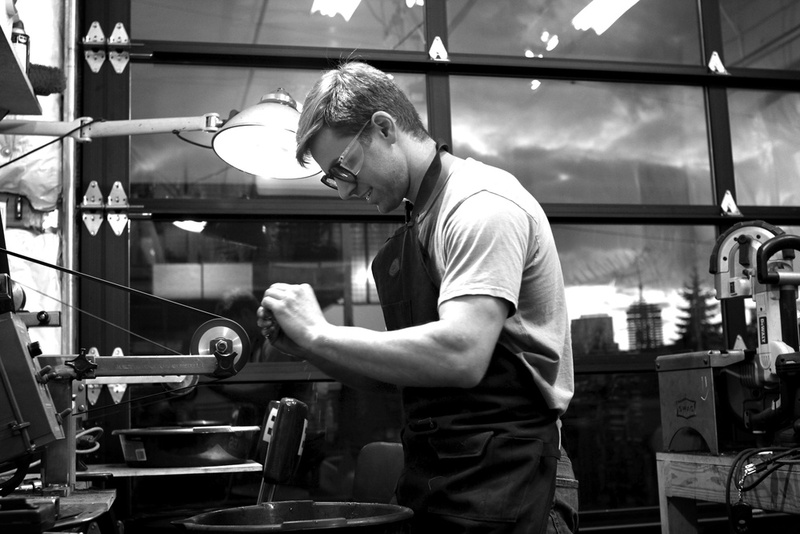 To inquire about honing services, email us at info@portlandrazorco.com. Please, don't just send us your razors; some cannot or should not be honed and we would rather have that conversation before you have paid for shipping! We Would Like to Welcome Hunter Lea to Portland Razor Co.! Hunter joined the team in 2014 as our first Apprentice Bladesmith and is now producing razors for customers. You will see a lot more of him in the coming months. New Location! Last month, we signed the lease on a larger work space and moved in on February 1st. February 10th we flooded due to a malfunction in the facility's fire-retardant sprinklers, which only delayed us a few days. We have maintained production during the move and are back up and running, but beg your patience and understanding if your order takes a little longer as a result. The new shop will afford us improved efficiency, as well as room for more advanced tools so we can keep production in-house and keep our standards high. The new shop is on 211 SE Madison Street #3, right under the historic Hawthorne Bridge and just minutes away from downtown Portland. Thank You. The support you have all shown is overwhelming. We love that the community is so involved with our company and want to help you feel more connected than ever on our blog and through social media this year. If you haven’t already, you can find us on Instagram, Twitter, Facebook, Pinterest, and now Youtube for an insider's look into our process.